Site Software is an open-source package installation tool which will quickly and effortlessly copy a wide range of open-source web scripts to your hosting space and then re-direct you to the installer to enable you to personalize your setup! By using Site Software you save time and bandwidth by not needing to upload large web scripts to your hosting space. 1. No need to download any CMS which will save your time. 3. Provided with latest Packages of CMS and E-commerce as per your need. 4. Installed in a proper way in an appropriate folder, no need to worry. 1. WordPress: The most popular open source Content Management System (CMS), used by approximately 75 million websites. WordPress is free to install, deploy, and upgrade. Thousands of plugins and templates power a flexible and simple interface, which reduces development costs and deployment.WordPress is popular because it meets the demands of many users with its flexible framework, which allows designers and developers to create and modify layouts and applications. Coupled with user-generated extensions, websites are no longer limited by enterprise extensions. 2. Joomla: It is a completely free open source solution available to anyone and everyone with a desire to build dynamic and robust sites for a variety of purposes. Joomla has been utilized by some of the Web's most recognizable brands including Harvard, IHOP, and MTV. It is capable of carrying out tasks ranging from corporate websites and blogs to social networks and e-commerce.It is important to think of Joomla not as a limited platform on which a specific type of site is built, but a robust set of tools that makes it possible to connect visitors to data in a variety of ways. Joomla's extensive set of integrated technologies empowers site managers and developers to innovate well beyond the bounds of a simple website. 3. Drupal: Drupal is content management software. It's used to make many of the websites and applications you use every day. Drupal has great standard features, like easy content authoring, reliable performance, and excellent security. But what sets it apart is its flexibility; modularity is one of its core principles. Its tools help you build the versatile, structured content that dynamic web experiences need. 4. 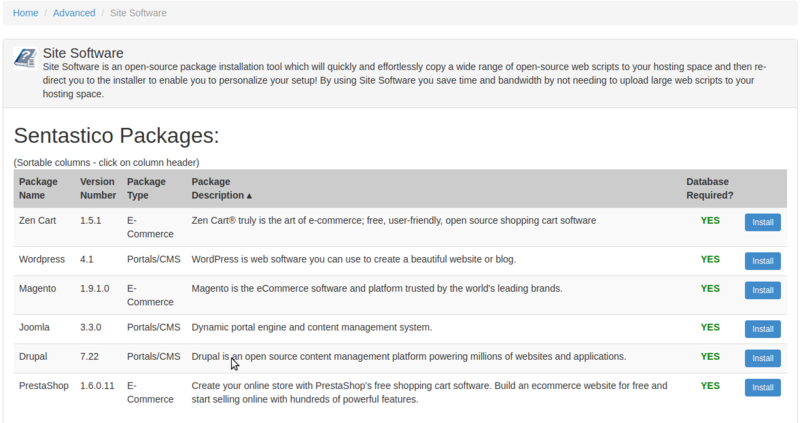 Zencart: It is an Open Source e-commerce application. It is written in PHP and requires a MySQL database. Zen cart provides easy customizations of your online store. ZenCart has a built-in system for receiving online payments, setting tax and discount rates, etc. Zen Cart follows a core+extensions model. It comes with enough features to get you rolling. From there, you need to add integrations in order to make your site perform exactly as you choose. 5. Prestashop: Create your online store with PrestaShop's free shopping cart software. Build an e-commerce website for free and start selling online with hundreds of powerful features.PrestaShop is one of the most popular online shopping cart scripts. Its community is very strong and it features many functionality improving plugins. Decent efficiency, good functionalities list, and rather simple modification make it one of the best scripts for programmers. 6. Magento: It is an open source E-commerce software, created by Varien Inc., which is useful for online business. It has a flexible modular architecture and is scalable with many control options that is helpful for users. Magento uses E-commerce platform which offers organizations ultimate E-commerce solutions and extensive support network.Magento features like different payment engines and shipping options along with the international support and high security using a private SSL certificate will make your shop an attractive place for e-commerce. Step1: Create Database and database user? before you press install button of appropriate package. If you have not created database and database user kindly click on the Open link to create , it will redirect to database page where you can create database. Next you need to select the domain name from the drop-down menu. If you want to install the package under domain root path then select the checkbox provided. If you want to install the package under sub folder mention the sub folder details under text box provided. Note: All the files and folders which is already present will be deleted once installation is done. Kindly take backup of the files and folders which is present in the appropriate path which you are going to select for installation. Step3: Once everything is filled click on install and it will take some time to get installed.